A woman who fatally stabbed her husband with a pair of scissors in a row about tidying their house has been jailed. 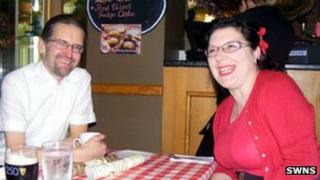 Sandra Clinch, 49, of Cornwall, lost her temper with husband Alan on 13 May and stabbed him. A jury convicted her of manslaughter on the grounds of diminished responsibility. Mr Clinch was flown by air ambulance to Derriford Hospital but died from his injuries. A judge at Truro Crown Court sentenced Clinch to nine years in prison. She was cleared of his murder. Sentencing Clinch, Judge Graham Cottle said: "Your principal defence of an accident was nothing more than purely fanciful. "The jury were satisfied that you were suffering from a personality disorder at the time you killed and it was that personality disorder that affected your ability to exercise self-control. "It has been a regular feature during your life. The evidence established beyond doubt you have been aggressive, abusive and violent towards previous partners as well as your children." Mrs Clinch, of Caradon Heights, Darite, Liskeard, initially told a 999 call operator she thought she had just killed her husband, adding that she had "stabbed him" in the chest. The court heard how the mother-of-five, who had been in a relationship with Mr Clinch since 2001, had repeatedly adapted details of her story to fit evidence and changed her account of how she thought her husband had been fatally wounded. Jurors were told by a psychiatrist that Sandra Clinch had a personality disorder and suffered uncontrollable mood swings. She had been married four times and all her relationships had been violent, the court was told. Clinch had, on occasions, punched, kicked and slapped her own children, jurors heard. Neighbours said they had heard her constantly shouting aggressively at her husband and another witness reported seeing her attacking him in a car park outside the DIY store where they both worked. Judge Cottle said: "You stabbed a previous partner with a carving knife and assaulted your children on a regular basis. "He [Mr Clinch] was a meek, mild-mannered and gentle man who simply took what you handed out. "I have no doubt on that evidence that you intended to hurt him badly and you embedded scissors in his heart and immediately after you regretted your actions." Following the verdict, investigating officer, Det Insp John Ardron, said: "The jury has decided upon a verdict of manslaughter for this case which we must accept. "It was a needless attack which was undeserved and resulted in fatal consequences for Alan Clinch."